Why England batsmen are failing to score continuously in Test Cricket? 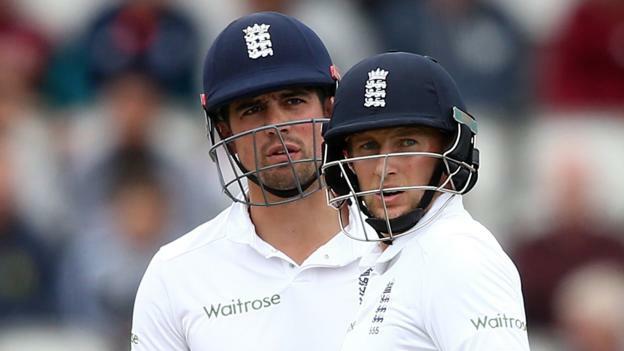 Eight Test match without a victory sees England in a position of bother. What agonizes the fans more is the manner in which they have performed in the recent past. And it is the overall batting that has been the root of all issues. In the 2017-18 Ashes, they lost the momentum in pivotal moments. In New Zealand, they failed to show grit in swinging conditions. And now against Pakistan, the 1st Test disaster at Lord’s was another compelling story. There have been many hard-hitting reasons to highlight the same as to why England have fared poorly. Runs have been hard to come by and the bowlers haven’t had the luxury to get breathing space. During this phase, one regular phenomenon for England was losing a flurry of wickets after doing the hard work. When one looks at their scores, it has been a prevailing factor. Against Pakistan at Lord’s they were looking bright at 92/2 in the second innings, but then went on to lose four wickets in a space of 19 runs. Another big partnership followed suit, but once a batsman got out, their last four wickets disappeared with a blink of an eye. Till now, the agonizing factor was away tours, but continuing the same struggles at home too have suggested one cannot blame the pitches or the conditions being unfamiliar. In the last 22 Tests, England has lost a staggering 13 times. Even prior to the Ashes in the series against West Indies, they had lost a Test despite an overall 2-1 win. In between these games and the one against Pakistan, they were also castled for 58 against the Kiwis. The current loss in which they were outplayed in every department, England looked a pale shadow of themselves. The agony continued and so did the haplessness. If there has been anybody who has, at least, shown some resistance, then it has to be these two senior stars. It has been two stark realities when these two have batted. Cook hasn’t been very consistent, but when he has scored runs he has been very sturdy. The southpaw has looked to knuckle down and grind out runs in an effective way. When we talk about Cook not being consistent enough, it shows the gap in his contributions. He scored a brilliant 243* against Australia in the 4th Ashes Test. And then six innings later, he got the defiant 70 versus Pakistan. In between, there were series of unattractive outings. Root, on the other hand, has been amongst the runs and is the leading scorer for England for quite some time. But as we have discussed many times in previous articles on the problems of him converting fifties into big scores. The reality for Root is that he has gone on to score consistently, but not consistent enough to get big ones. One can see that the manner in which the Englishmen have often batted is that they are always looking to dominate. England has enjoyed a ton of success in ODIs during this phase and their frame of mind while approaching Test is pretty akin to the limited-overs format. Although the dominating approach is a lot enjoyable and entertaining, it has its elements of risks. They have lacked the necessary concentration levels required for Test cricket. In Test matches, one requires to build his innings ball by ball and session by session. The quick runs mentality counters the same. Besides Cook, there haven’t been any big hundreds scored by the English batsmen. That tells you a lot. Who should be blamed? For majority part of the year, the focus of cricket is mainly in T20Is and ODIs. But on the contrary, one cannot give that reason for not being smart enough in Test cricket. The likes of Virat Kohli, Kane Williamson and Steve Smith have plundered runs in Tests in a striking manner. In Tests, one needs the positivity of applying themselves and technique is crucial. A quickfire 50 in a limited-overs game has is value, but in Tests, one needs big scores. Mark Stoneman has been omitted from England’s 2nd Test against Pak and they have given a chance to youngster Keaton Jennings. The player has played five 50-over games for Lancashire on the trot and will suddenly find himself facing the red ball bowled by a famed Pakistani bowling line-up. England have tried several names in the past few years and when you look at the team now, many of those players aren’t there. When you go further into it, there have been plenty of debutants too. Alex Hales made his debut in 2015, but never featured again since the last series against Pak in 2016. James Vince featured against New Zealand recently after making his debut in 2016, but against Pakistan, he wasn’t selected. And like this, there have been many other players, who have come and gone. Now its the turn of Mark Stoneman, who has struggled immensely with the bat. Majority of these players haven’t contributed enough to stake a claim. In the 2017-18 Ashes, England batsmen only managed three centuries. That was way below the mark Australians had (10). Last year, when they faced South Africa and West Indies at home, in seven Tests they accumulated five hundreds. So why are players not being able to get runs in excess of a hundred-run figure? Against New Zealand, no player mustered a ton and that continued against Pakistan too. When big scores are not scored, the game in itself is lost no matter how well you bowl. Can one say is technique an issue? When you watch English batsmen play, the feet movement has been disappointing. Australia, New Zealand and Pakistan boast of international quicks of a high value and feet movement is a must. The likes of Jonny Bairstow against Pak failed because of having an intent of forcing a shot, rather than going defensive. That’s where technique comes into play. Stoneman too suffered in not knowing how to get his movement right and that saw him fall cheaply as well. How can they fix problems? England has to bat smarter in Headingley. A collective approach may help in thinking more clearly about the attributes the bowler has and what’s the plans they are using to get maximum purchases. Also, how is the bowler trying to get him out? One, therefore, needs to put a price on his wicket. England needs to resist in playing expansive drives and chase the ball. Often when glitz doesn’t work, then the idea is to grind it out. Cook and Root should bring them help. Big strides could come handy too against certain bowlers. PreviousIPL 2018: How good were the West Indians this time around?